The body of 16-year-old Travis Coates lost a grueling battle with cancer, but Travis’s head, his brain, is still going strong after a groundbreaking cryogenic experiment. Travis opens his eyes after what seems like a quick nap, but everything is different in the world, and 5 years have passed since he closed his eyes. His sick, frail body has been replaced with the strong, healthy body of a 16-year-old who died of brain cancer. Now Travis has a telling scar connecting his head with the new body. Everyone in his life thought they’d never see him again so he has to find out how he fits into the world. His girlfriend, Cate, is now 21, and is engaged, but it seems like no time has passed for Travis. His best friend, Kyle, is struggling with secrets he thought would die with Travis. 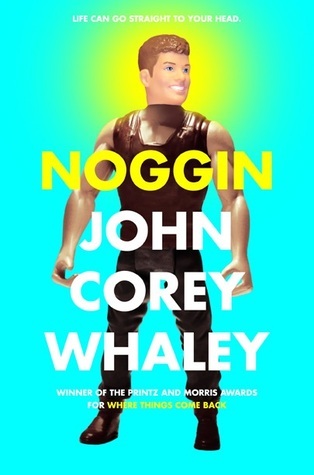 Noggin is a charismatically told story of self-discovery and reinvention that will appeal to audiences of all ages and interests. Humorous, quirky and heartfelt, this book has it all. I thoroughly enjoyed this latest offering from a brilliant author! Highly recommend. This entry was posted in highly recommend, humor, realistic fiction and tagged cryogenics. Bookmark the permalink.